EPUB, developed by International Digital Publishing Forum (IDPDF), is an open format based on XML/XHTML. It is one of the most common eBook formats and widely used by various retailers and supported by all kinds of devices, including Adobe Digital Editions, Kobo eReader, Apple’s iBooks app, Sony Reader, …. However, the well-known Amazon Kindle series do not support it. For Amazon Kindle, AZW is the most welcomed format, and AZW3, released by Amazon in late 2011 along with the release of Kindle Fire, is a variation of AZW and also known as KF8. Compared to AZW or MOBI, AZW3 is more advanced by supporting more styles, fonts and layout. At beginning AZW3 was only supported by Kindle Fire tablet, but later expanded to Kindle 4th generation and Kindle for PC/Mac. Hereby, if you’d like to read .epub files on a Kindle device, such as Kindle Fire, Kindle Paperwhite, Kindle Oasis …, it would be practical and efficient to convert .epub files to Kindle-supported AZW3 format. 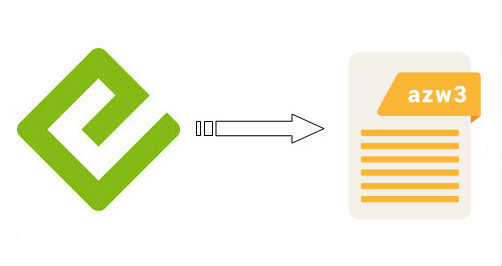 In this article, we are going to introduce an easy way to convert EPUB to AZW3 format, which enables you to make it within three simple steps. Any eBook Converter is a professional eBook tool that is able to remove DRM from Kindle, Adobe, Kobo & Nook eBooks and convert up to 24 input formats (EPUB included) to DRM-free AZW3, PDF, MOBI, EPUB, TXT, and KFX format in batch. 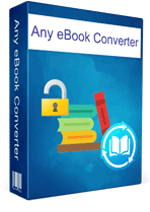 Any eBook Converter is a simple and user-friendly program with a concise interface. 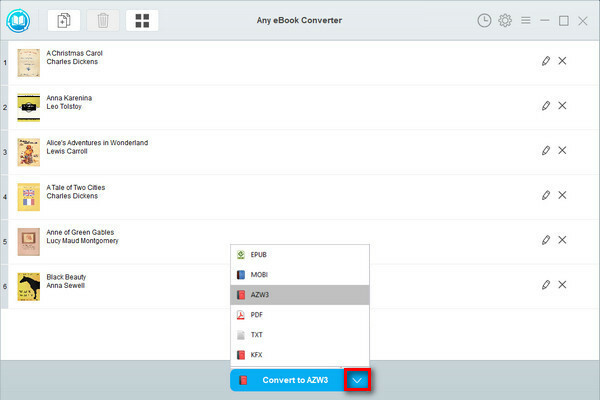 Below is a full demonstration of how to convert EPUB to AZW3 with Any eBook Converter. Before we get started, please have the program well installed on your computer. Click "Add eBook" button on the upper left. There will be a pop-up window prompting you to browse and upload the EPUB books that you want to convert to AZW3 format. Click “V” icon on the bottom and select “AZW3” as the output format. By clicking the “Settings” button on the upper right, you can customize the output path for the converted books. 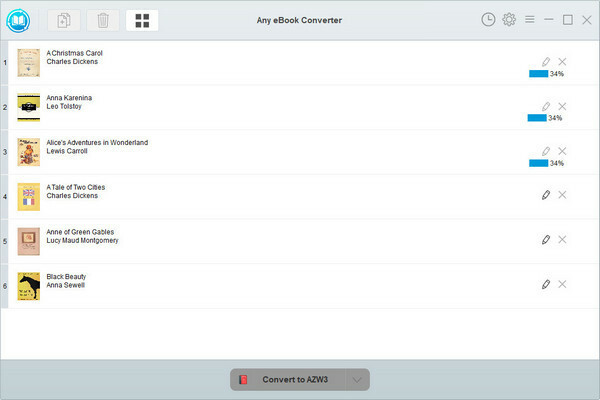 Click "Convert to AZW3" button to start converting your EPUB books to AZW3 format. 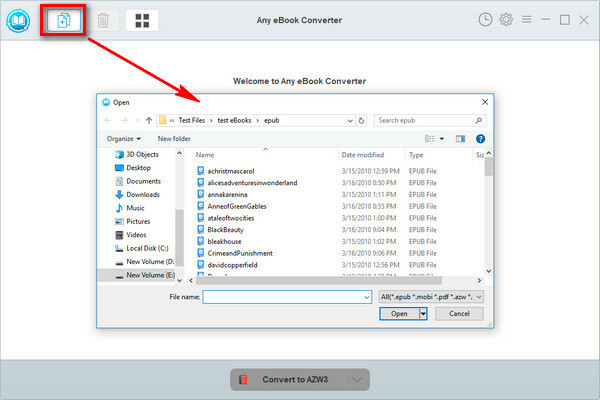 When the conversion is done, you can find the converted AZW3 files by clicking the “History” button on the upper right or directly going to the output folder you set in previous step. Now that you've got your EPUB books in AZW3 format, you can open them easily on an Amazon Kindle. Simply connect your Kindle device to your computer with a USB and transfer the converted AZW3 files to the device.